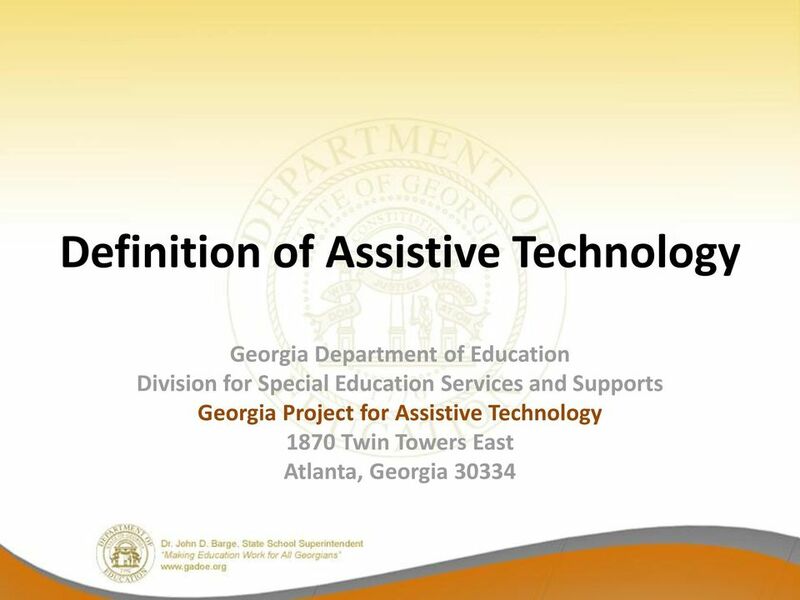 Download "Definition of Assistive Technology"
2 Assistive Technology Device Section Assistive technology device. 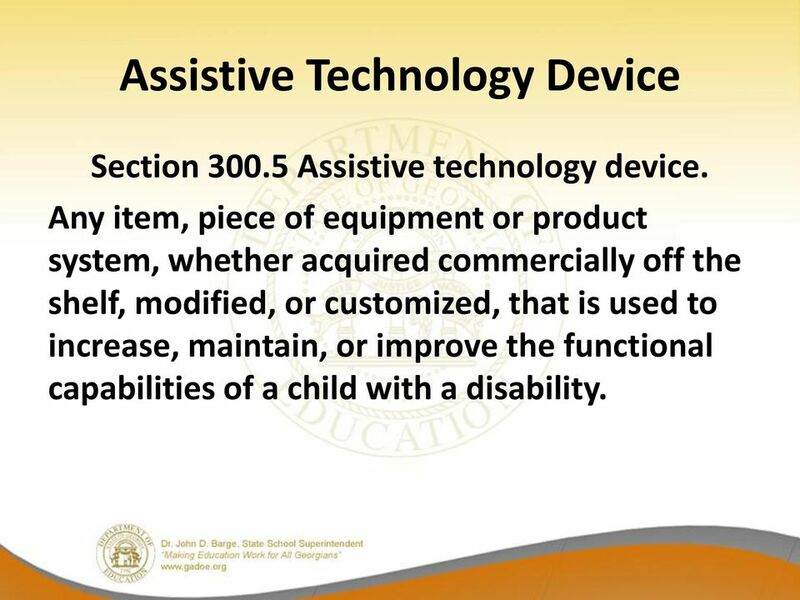 Any item, piece of equipment or product system, whether acquired commercially off the shelf, modified, or customized, that is used to increase, maintain, or improve the functional capabilities of a child with a disability. 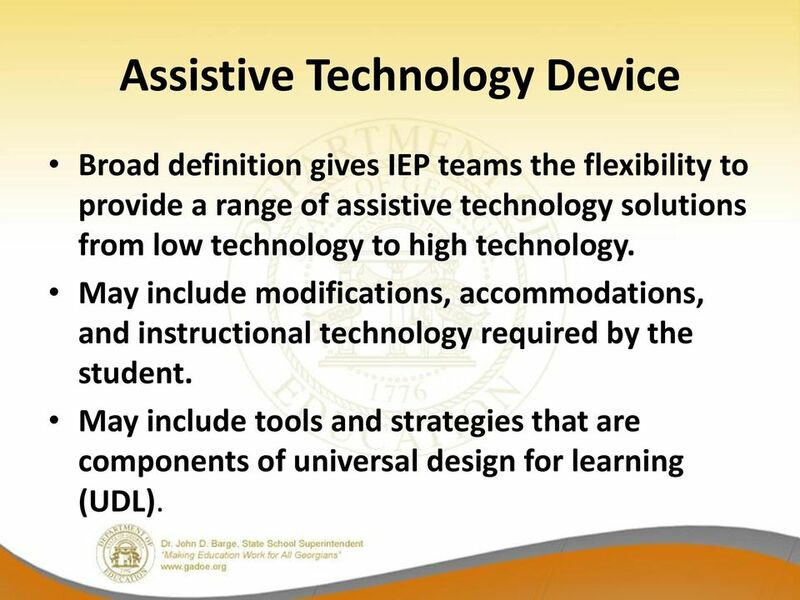 4 Assistive Technology Device Broad definition gives IEP teams the flexibility to provide a range of assistive technology solutions from low technology to high technology. 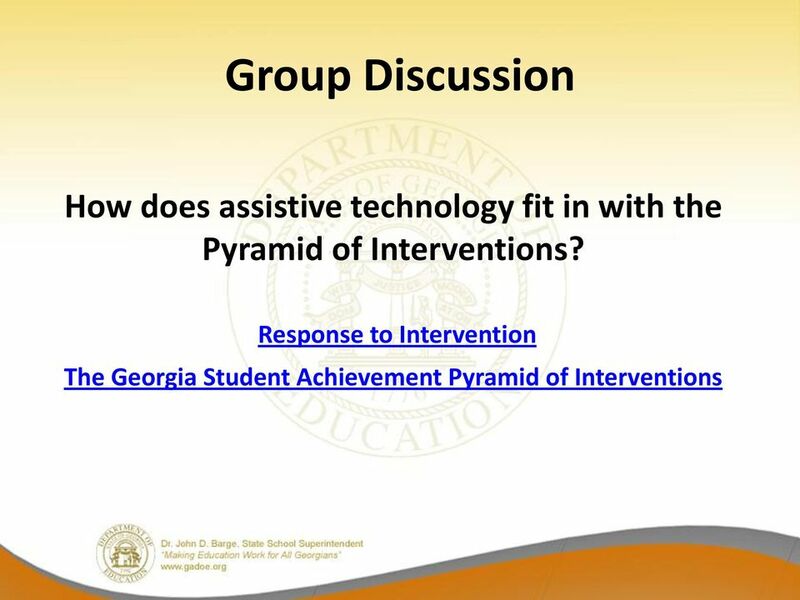 May include modifications, accommodations, and instructional technology required by the student. May include tools and strategies that are components of universal design for learning (UDL). 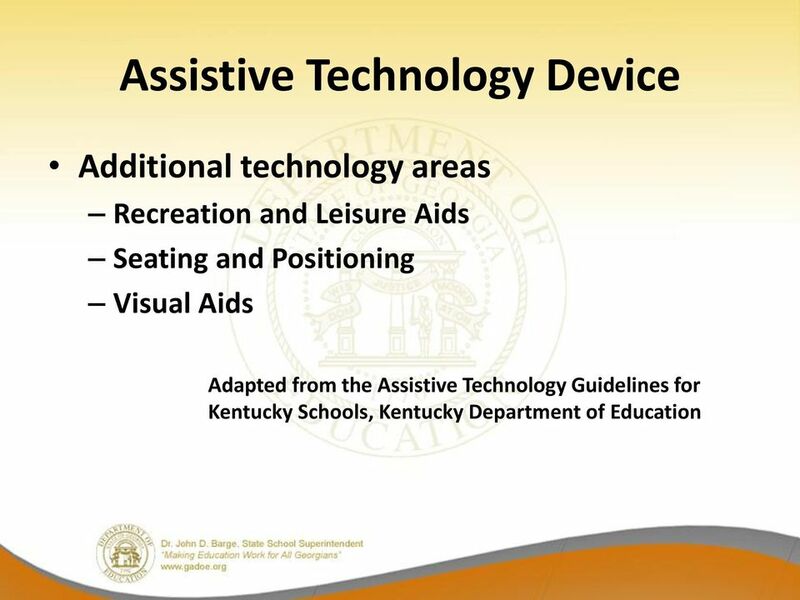 13 Group Activity What types of assistive technology devices are used by students in your school district? 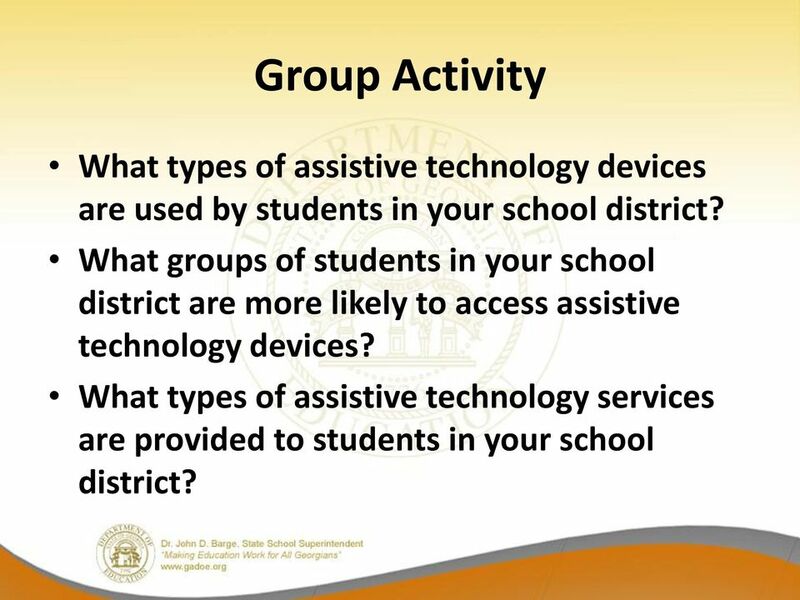 What groups of students in your school district are more likely to access assistive technology devices? 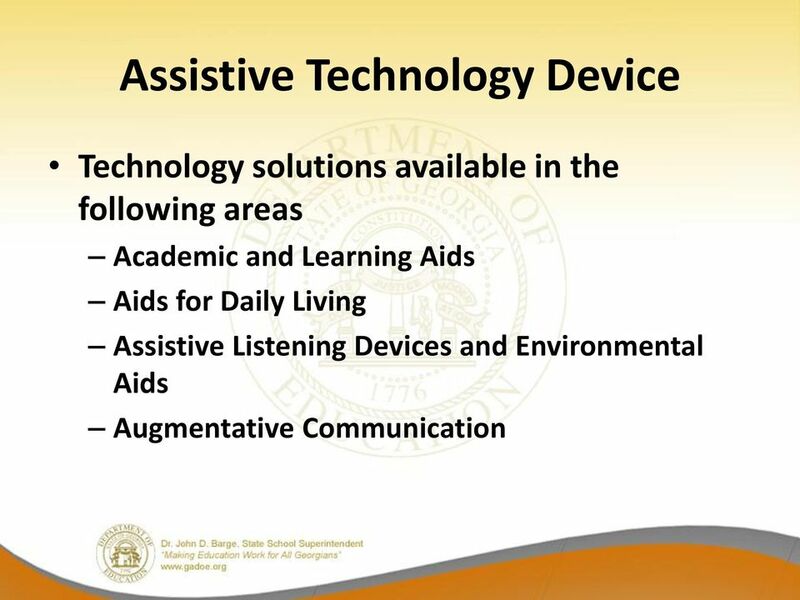 What types of assistive technology services are provided to students in your school district? 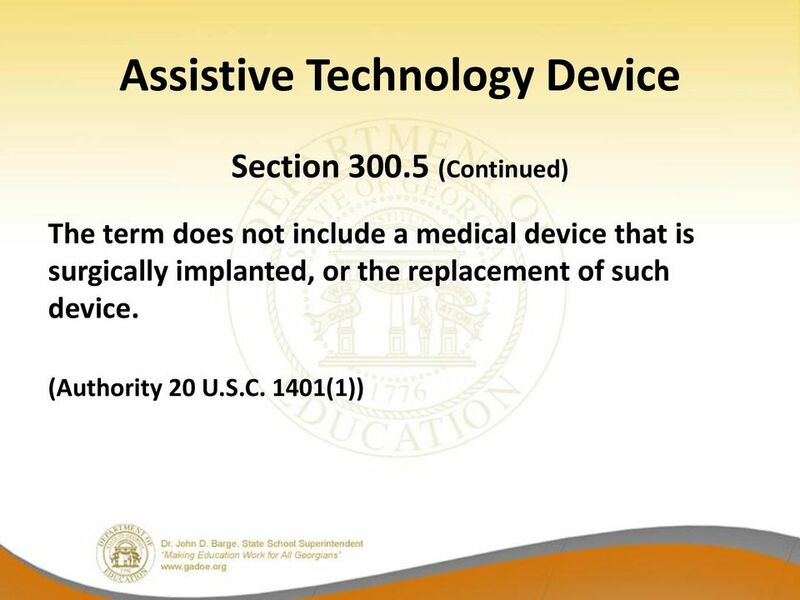 This definition is very broad and can include anything from a pencil grip to an electronic augmentative communication system. 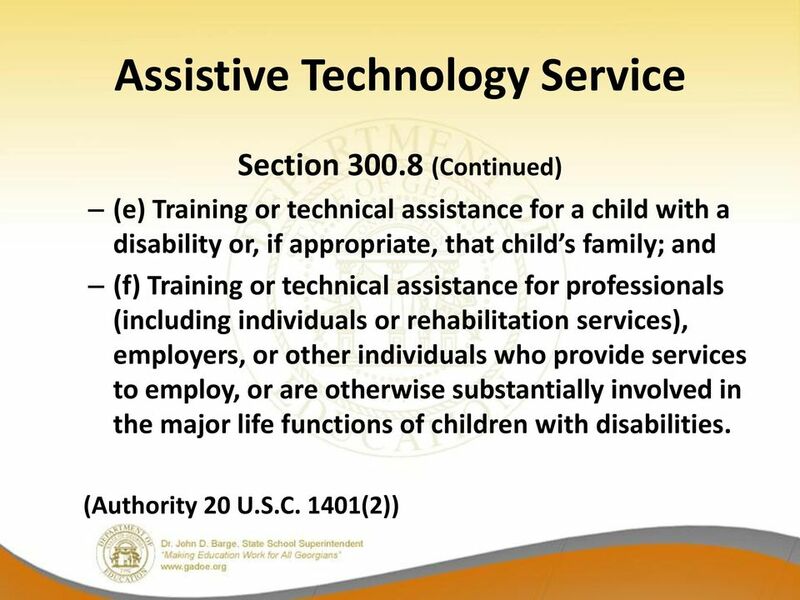 Assistive Technology Legal Reference Assistive Technology service means any service that directly assists a student with a disability in the selection, acquisition, or use of an assistive technology device. 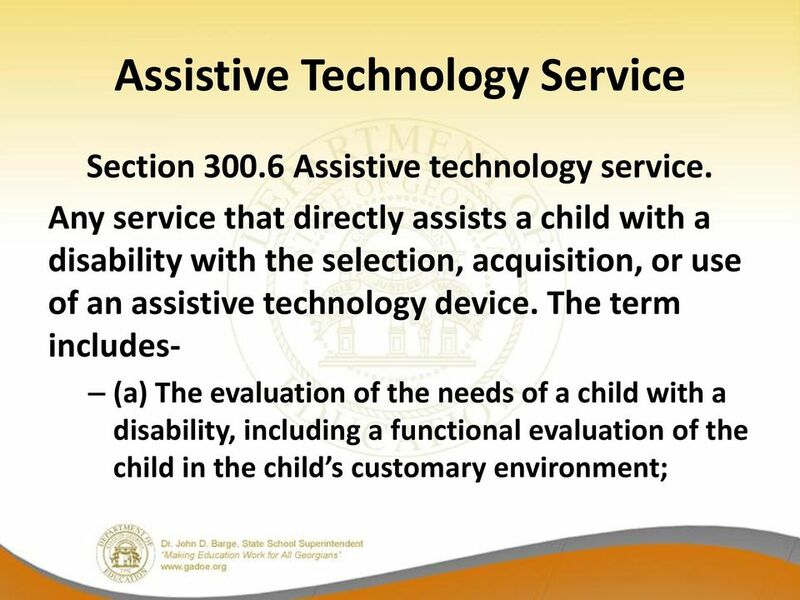 WOULD YOUR CHILD BENEFIT FROM HAVING ACCESS TO ASSISTIVE TECHNOLOGY? 1. 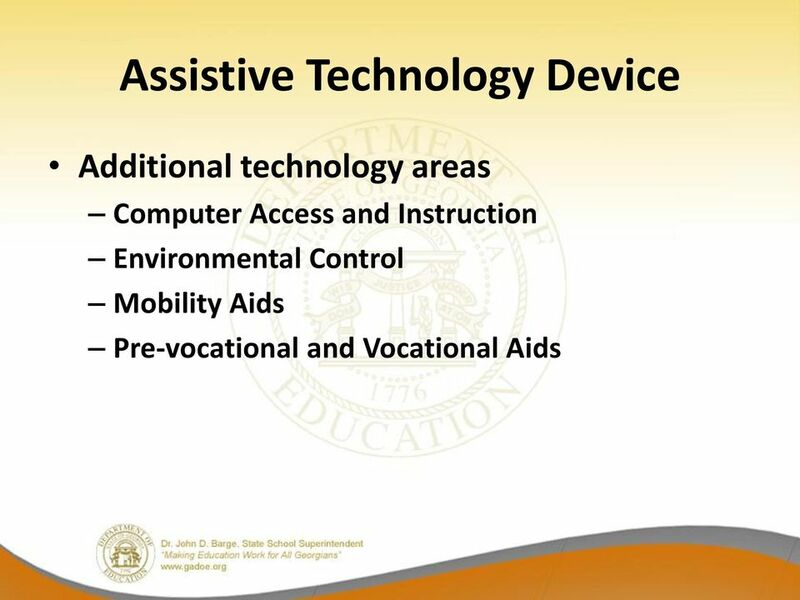 What is an assistive technology in special education? 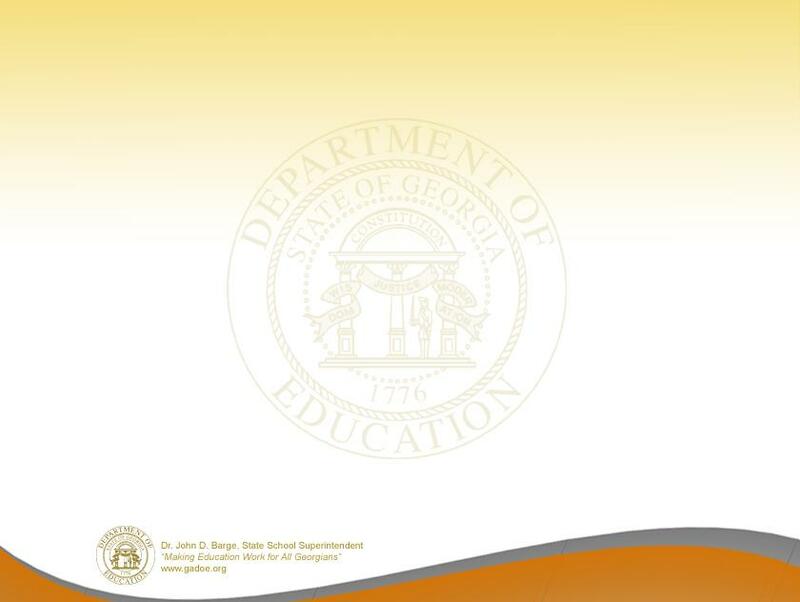 (2) Adult student - A student with a disability, age 18 or older, to whom rights have transferred under the IDEA 2004 and Georgia Rule. 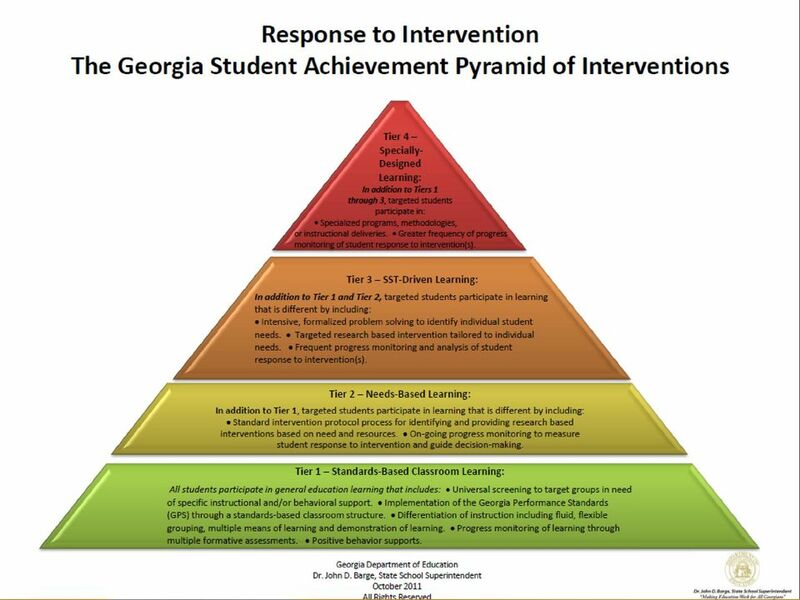 PHIL BREDESEN GOVERNOR STATE OF TENNESSEE DEPARTMENT OF EDUCATION DIVISION OF SPECIAL EDUCATION 7 TH FLOOR, ANDREW JOHNSON TOWER 710 JAMES ROBERTSON PARKWAY NASHVILLE, TN 37243-0380 TIMOTHY K. WEBB, Ed.D. ASSISTIVE TECHNOLOGY FOR PERSONS WITH DISABILITIES: AN OVERVIEW Figure 1: Man in manual wheelchair going up ramp to building. Prepared by: Disability Rights Network of Pennsylvania www.drnpa.org 1414 N.
Related Services: How Do Special Needs Education Relate to Your Child? You have received this survey because you are a Vocational Rehabilitation administrator or senior management personnel. You are being invited to participate in a survey to gather information on the rehabilitation and assistive technology (RT/AT) service delivery models that have generated successful employment outcomes. 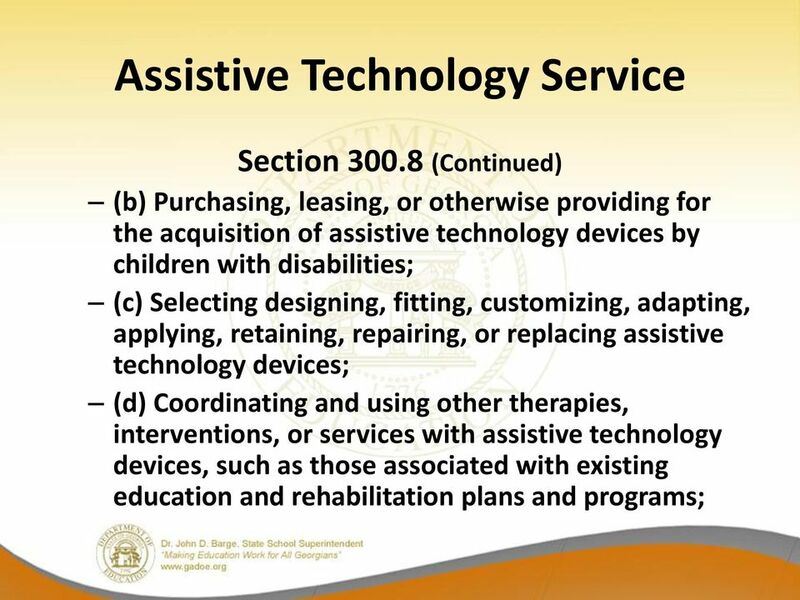 PROGRAM FOR LICENSING ASSESSMENTS FOR COLORADO EDUCATORS (PLACE ) TEST OBJECTIVES Subarea Range of Objectives Approximate Test Weighting I. Knowledge of Students with Disabilities 001 003 15% II. III. 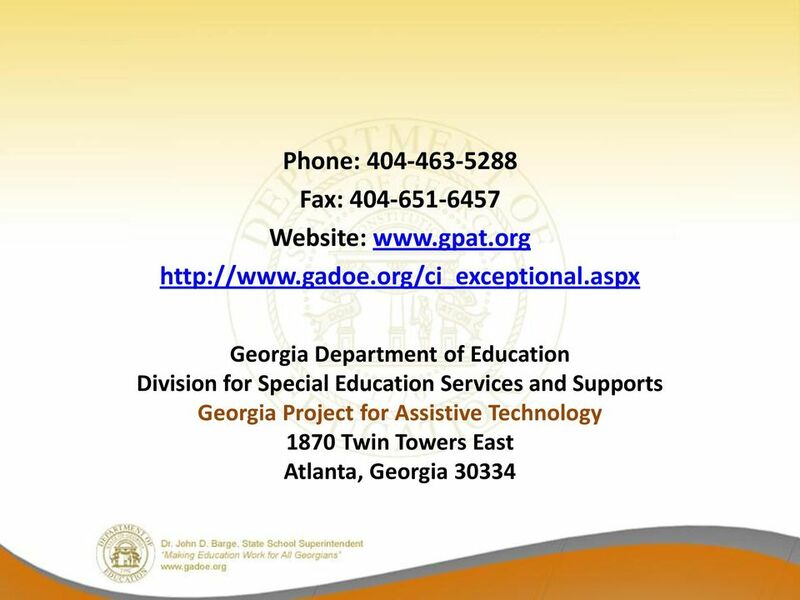 The Georgia Special Needs Scholarship (GSNS) Program is a parental choice program for special needs students attending Georgia public schools who are served under an Individualized Education Plan (IEP). 504 or IEP: Which is Right for my Child?